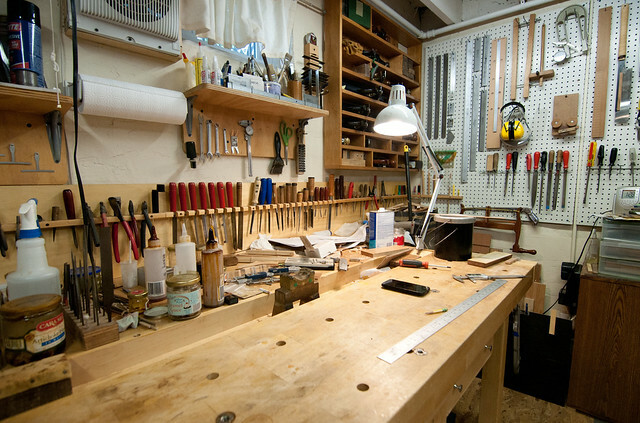 What does it mean to be a true artisan? Spend some time with Luis Fernández de Córdoba and you will understand. 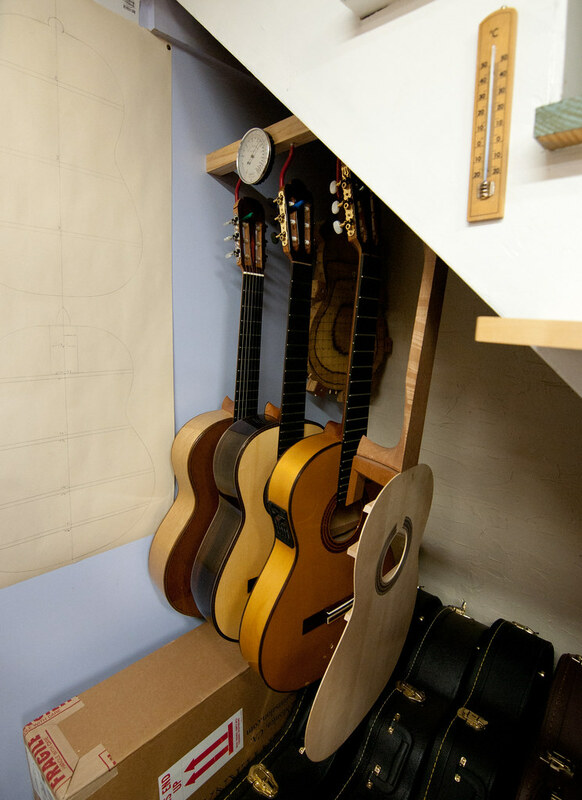 Luis is a skilled luthier, or stringed instrument maker, who handcrafts classical and flamenco guitars in the tradition of the great European master luthiers in his workshop in Alexandria. 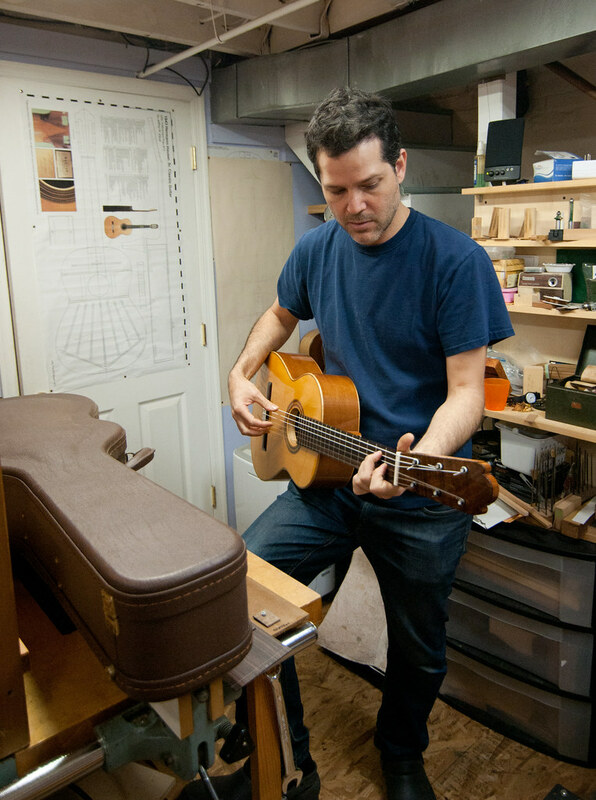 To Luis, making a guitar isn’t just about creating something functional, or even something visually stunning, it’s about creating something that inspires people, both the musician and the listener. Growing up in Panama, Luis was drawn to the alternative lifestyle of the artisans he’d see selling their crafts in the market. 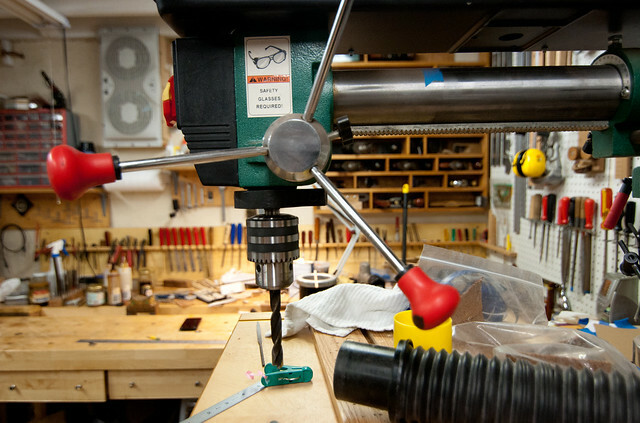 He came to the United States and started experimenting with building guitars. As a bass player, it seemed like a natural route to take. Soon, he realized that he had a skill for this type of work. He went to a school in Arizona, received his guitar-making certificate and then started an apprenticeship. 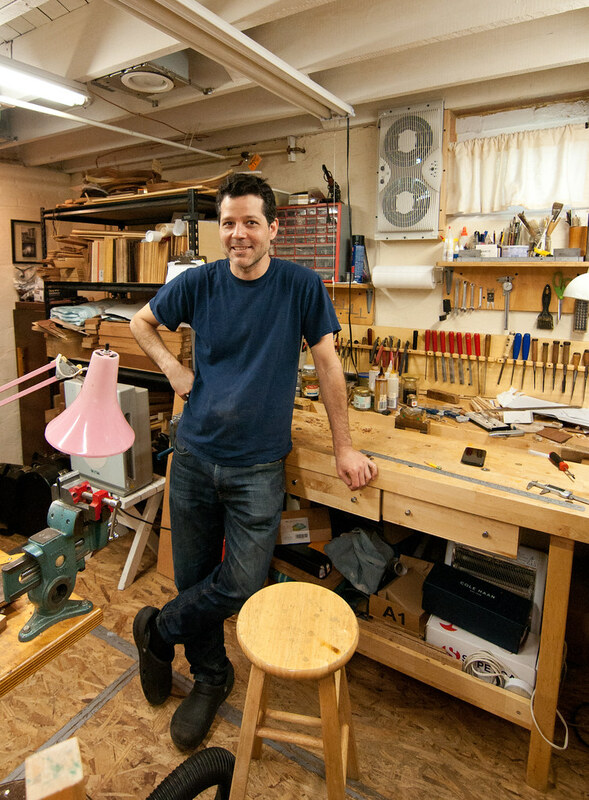 He’s met fellow luthiers from across the world, constantly studies new techniques to perfect his craft and is a member of the Guild of American Luthiers. Luis works out the basement in his Old Town rowhouse, a home he shares with his wife and two small children. 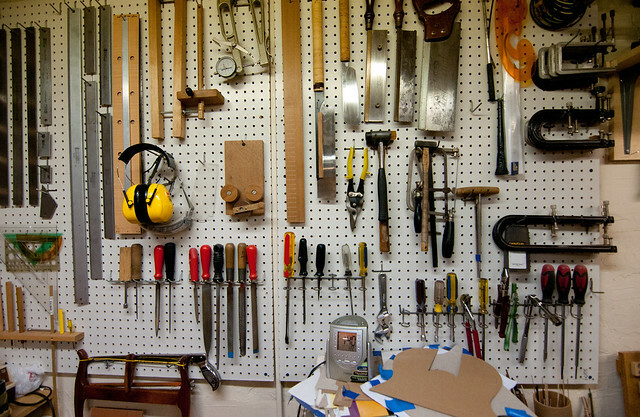 Space is at a premium — the workshop is approximately 12×12 feet — but he keeps everything accessible and organized. 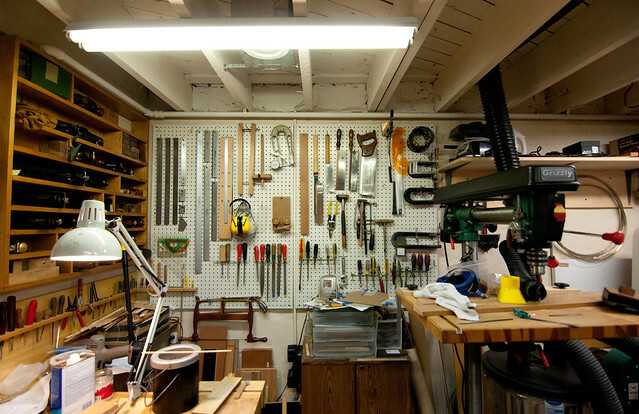 Hundreds of tools line the walls, wood is neatly stacked on shelves and guitars in various stages of development hang from the ceiling. 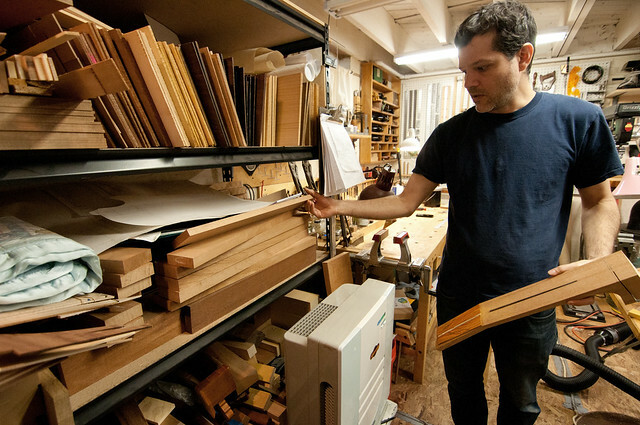 Luis orders the wood from various suppliers around the world — cedar is commonly used. And as you can imagine, working out of a basement requires strict moisture control. The wrong humidity level could severely damage the wood. I saw several thermometers and humidity gauges on my visit, plus humidifiers and de-humidifiers to regulate the air. 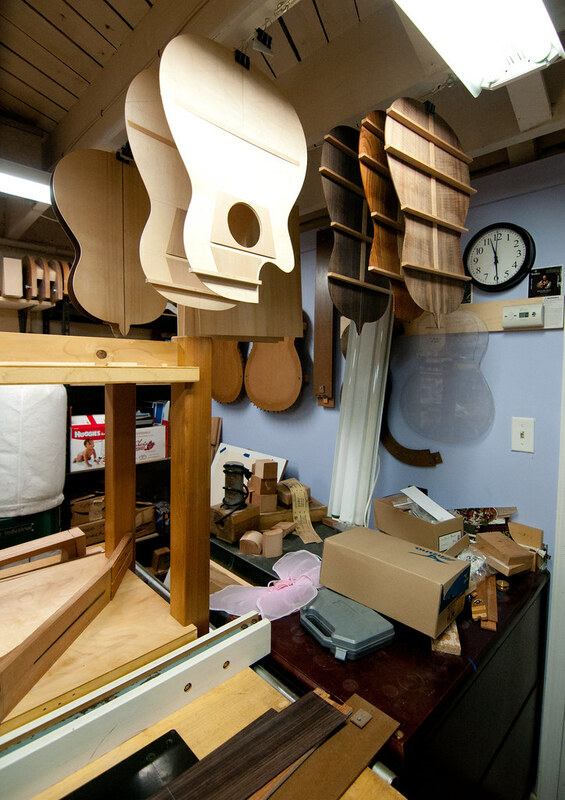 Each guitar takes about a month to make. It’s a full-time job for Luis and he spends about 8 hours a day in his basement. He loves the solitude and the freedom to work for himself. You can watch this video produced by Luis to see the entire process (one month time lapsed down to 13 minutes). A few of the finished guitars are currently awaiting buyers. He sells his guitars on his website and works with a dealer on the west coast. 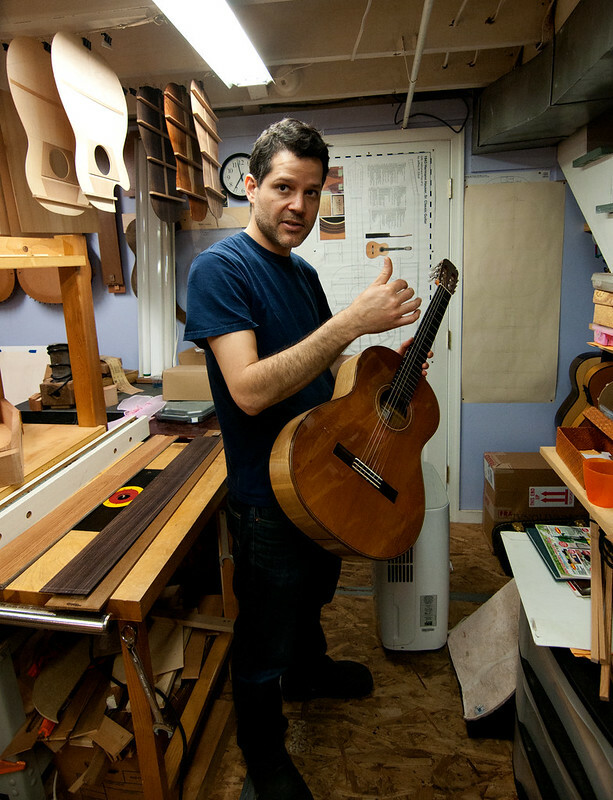 In addition to building guitars, Luis also does repair and restoration and he’s open to a few challenges as well. 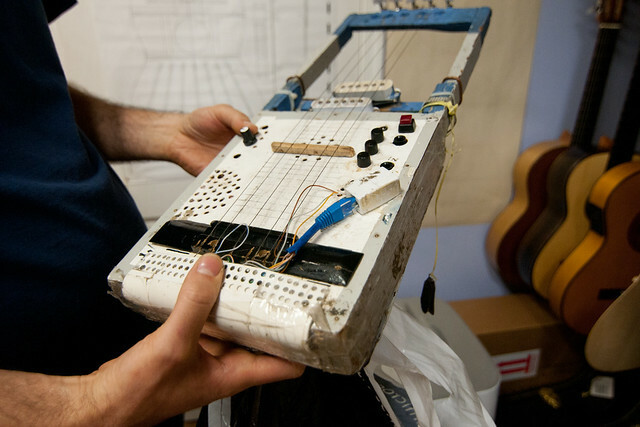 Take this Middle Eastern instrument for example, DIYed by a gentleman who works at a gas station in north Old Town — yes, that is packing tape holding it together and a telephone cord supplying the connection for the instrument’s built-in amplifier. 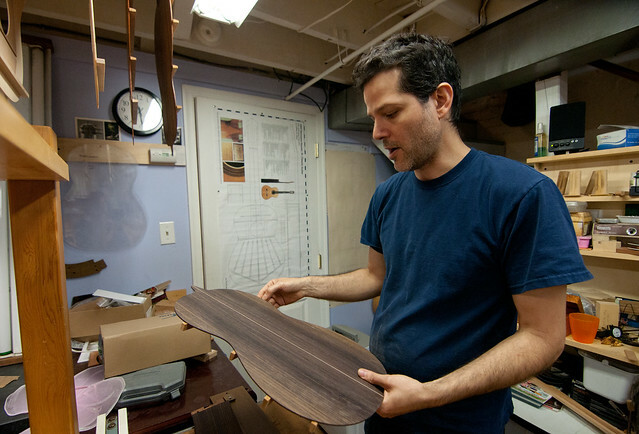 The owner approached Luis and asked if he would re-create an acoustic version of the instrument out of wood. Luis hasn’t started yet, but we hope he lets us know when the new version is done. For more about Luis, visit his website and follow him on Facebook. Thank you Luis for sharing your work with us! Hi, its great to see a post from other point of view. I know Luis from when we were like 16, and he was a great bass player. 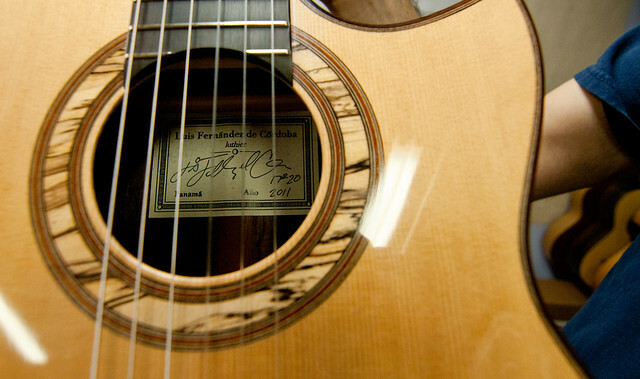 Ive seen and played one of his guitars here in Panama, made with cocobolo wood, many years ago, and ws amazed by the quality of the finished details and the clearness of the sound. Keep it up!